I knew the weather was going to be pretty much perfect on Saturday so I took that as my chance to start experimenting with some of the new items that I picked up over summer and couldn't wait to start wearing, but had to because, well summer! I can't get enough of my chambray top from Cloth & Stone. You've seen it here & here! 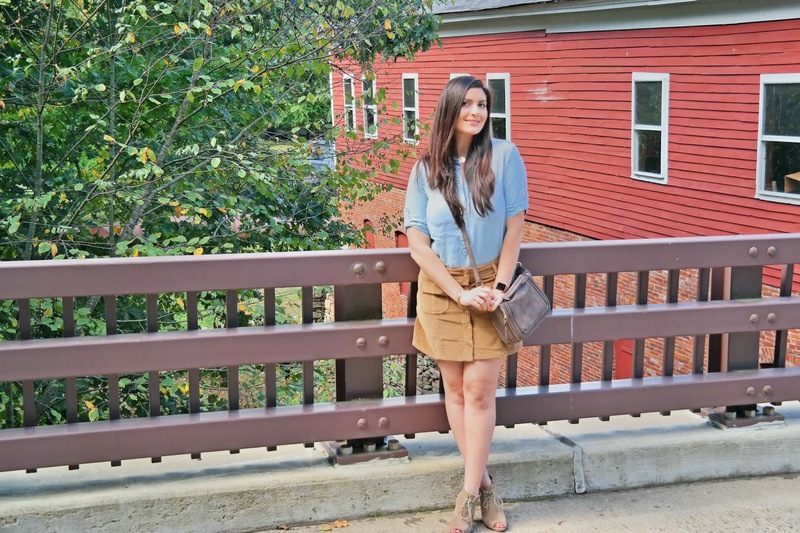 I love how versatile it is, even more so that I can easily transition it into fall with this corduroy skirt that I scooped up during the Nordstrom Anniversary Sale - I couldn't wait to start wearing it! The purse was a recent find at TJ Maxx a couple weeks ago. I was drawn to it because it reminds me of the Chloe Saddle bag for about 85% off!! It's a no-name brand that's perfect for the weekends! I'm sure if you were to go to your local TJ Maxx you would be able to find it! These lace up booties from Loft are the best of both worlds - again, not a current purchase but they do have black closed toed lace up ones on sale right now! I can only wear these for a few weeks before it's too cold for the toes to be out - but they are insanely comfortable! I might have to slap myself after writing this, but I'm looking forward to pairing this skirt with a black long sleeve top, tights & boots when it gets even colder! I realized after being on Mount Holyoke's campus that I seriously miss the feeling of starting classes - not actually going to class and doing homework, but the feeling of being on campus! Is there anything you are excited to start wearing now that the weather is getting cooler? How was your weekend? Link up below to share it with us! I love the combination of the chambray and corduroy! Such a cute look for fall and those open-toe booties are too cute! Happy Monday! You look gorgeous! Love the chambray with the skirt! And those little booties, too. Super cute and totally different from what I have seen before. I am with you on missing the start of school, but I definitely don't miss attending classes and all the schoolwork that went with them! This is such a perfect outfit for fall. That skirt is such a great find at the Nordstrom sale! It is so versatile and a chambray shirt can be worn just as many ways. So glad you had a nice weekend and that the weather has cooled off a little for you! BINGO.....BEAUTIFUL!!! So Fall, so chic and so you. Darling combo and such cute peep toe boots, I have not seen any like that and I love them!! Gorgeous photos and happy, Happy Monday!! First, I'm so jealous that you are actually getting fall weather! Second, you look so cute and absolutely gorgeous! Glad you had such a great weekend! Love that you were able to enjoy fall! I wish we had wonderful weather like that here! Love the outfit together and Cloth and Stone is the best maker for chambray in my book! I'm with you on missing being on a college campus as a student--I miss being in Tuscaloosa but especially this time of year! Did you go to Mount Holyoke? Girl, you always look amazing in chambray! I love this entire look from head to toe... especially those booties!! Whenever I go to a campus I have those feels too- just a bit of nostalgia! I adore those booties! I like the outfit! I want to see New England in the fall sometime. I loved being on campus and totally know what you mean! This campus is beautiful and I love your outfit. Those booties and bag-- great find! I wish I was a skirt person because that corduroy skirt is adorable! Love that color too! WAAA! SO IN LOVE WITH YOUR PICTURES!!! <3 I JUST HAVE TO VISIT MASSACHUSETTS SOME TIME! This outfit is fall perfection at its finest!!! I love every piece you paired together and I can see it being a classic staple in your early fall wardrobe for years to come. We are going to drop to the upper 70's a few days this week and I am beyond ecstatic!!! I am sure it will be November before I pull my boots out, but a girl can pretend right??? obsessed with your outfit! i love that bag and especially for the price point! can't go wrong. chambray is so classic - you can't go wrong - and it goes with all things! happy monday girly! This outfit is absolutely something that I would wear! 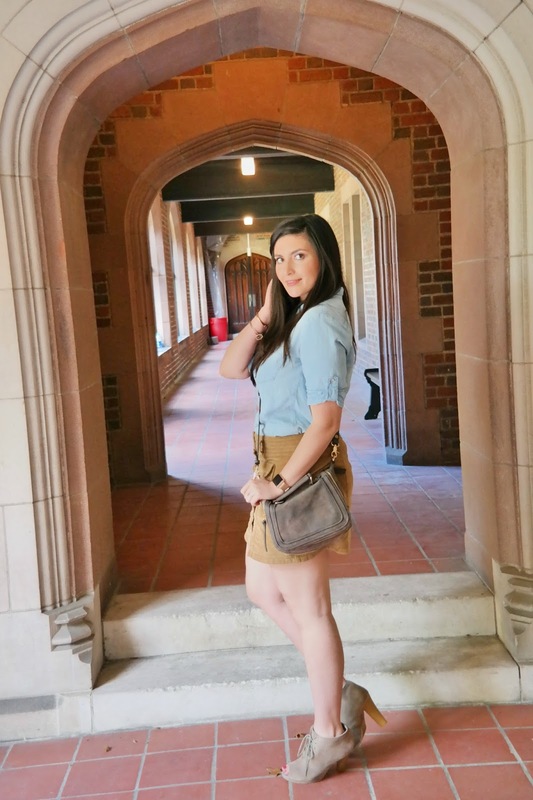 ... probably because I already have a chambray top & corduroy skirt in my closet that I pair together on a pretty regular basis :) I'm loving this fall look & the pretty campus that you found on Saturday. Have a great week! This look is so cute for fall! Love those A Line skirts right now too! and the bag! I actually just posted some Chloe bag dupes on my blog a few weeks ago....also from TJ Maxx and Marshalls! I love chambray!! I want a pair of open toe booties but haven't found a pair I loved for the right price considering our weather situation in Erie and how long I could wear them. You look so beautiful in all these shots, love the scenery too! What a babe, seriously! I've been living in chambray for the past two years (it's even on my post today, lol! ), but with that suede skirt it's definitely a perfect fall outfit! And have I told you how much I envy your hair? Gosh, my hair needs to hurry up and grow! Obsessing over this skirt on you lady! It is so cute and I love the way you styled it so chic and so fab! Wishing you a wonderful monday! You know I love me some chambray in the Fall...and the Winter! I saw a cute chambray shirt dress at Target this weekend but didn't try it on and now I regret it! Absolutely love this outfit, especially those booties! Loft is the BEST! I love, love, love the way that chambray shirt looks paired with that cute corduroy skirt, it's the perfect transitional outfit and I'm also swooning over those super cute shoes, too! I've never been up north to New England before, but Eddie and I have been talking about visiting, especially now since we live in lower CT, it's more of a friendlier drive. My mom's been to many areas and always shares how charming and gorgeous it is there, especially during the fall. Girl, I feel you, I get the same way, especially come September, it STILL feels weird to me that I've been out of college for so long, haha. I'm telling you, time is flying! Anyway, you look absolutely gorgeous as always, girlie, and I hope you're having the best start to your Monday so far! Absolutely love this outfit girl! The suede/chambray combo is just adorable and perfection transitioning into fall! I'm hoping that things really start to cool off down here, especially since a cold front is supposed to be rolling in later on this week! I'm excited to break out and wear all the scarves, sweaters, and boots/booties that I can! 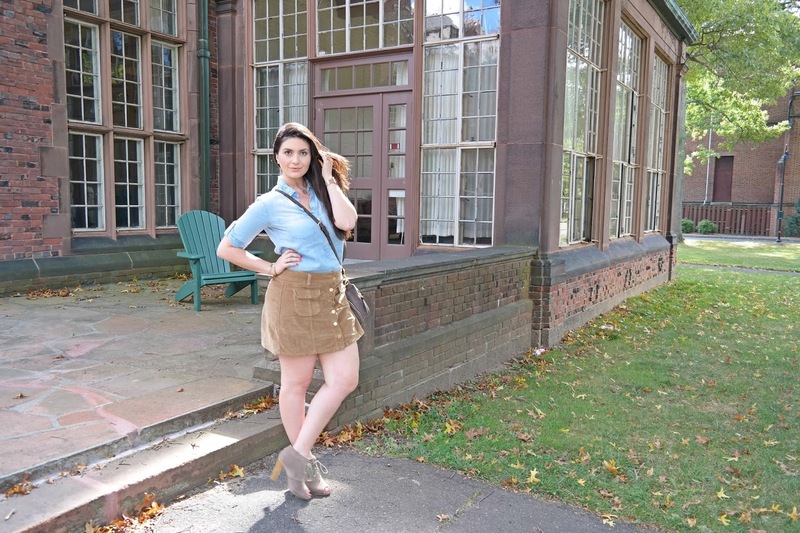 I love the way that you paired your chambray shirt with this corduroy skirt! Both pieces really are so versatile, and you'll be able to wear them so many different ways this fall! I am always all about chambray. Love how you styled it with that skirt. Happy fall! I'm just in looooove with those booties! The color and heel height is so fantastic!! You look GORGEOUS! Love love love that purse. You find the best stuff at T.J. Maxx. I never have kinda of luck. I so need to find that purse, so fab for the weekend. Happy Monday!! It was sooo cold here this morning. Eep, Fall is here. love all the photos here-looks so Ivy League! Love the chambray with your pretty skirt and booties. Perfect for fall. I love weddings! Sounds like fun. These pictures of you are the cutest! This is such a great transitional fall outfit. And, I'm with you - I always get nostalgic for school this time of year! Fun button up skirt! Love the look! Ohh I totally don't blame you for wanting to stop there to take photos-- such a perfect location! I'm obsessed with that saddlebag, and those booties are perfect for the in-between weather! I adore everything about this outfit, Biana! You look absolutely amazing. The skirt is so on trend right now and you honestly can't go wrong with chambray. I love how versatile it is and literally goes with absolutely everything. Your shoes are so pretty too and they look quite comfortable. I'm totally with you about missing the feeling of just being on campus with friends, brings back so many memories! You look gorgeous! And these photos make me want to take a trip to New England for fall ASAP! I just bought the cutest long sweater knit vest at TJ Maxx this weekend & CANT WAIT to wear it. SUCH a cute pair of shoes, too, girl!!!! :) You look fabulous, as always! LOVE the brown and chambray combo! New England is the most picturesque background! I love your ankle boots!! I was up in Maine this weekend and I was so excited that it was finally starting to feel like fall! Love your look! This is such a great look on you and those booties are fabulous!!! New England in the Fall! Seriously no better time! I love this look! I just got a skirt like that at Target and I am totally copying. That campus is so pretty! These photos are gorgeous!! Such a perfect fall look!! Love this fall outfit, especially those cute booties! Gorgeous backdrop for some fall fashion! I can't believe I still don't own a Chamray top....so pretty on you and those booties just scream Fall comfy! You look adorable in this!! I cannot WAIT for cooler weather here, it's so hot and miserable still. Youre such a babe! The chambray with that adorable skirt is perfect! Obsessed with those booties too! 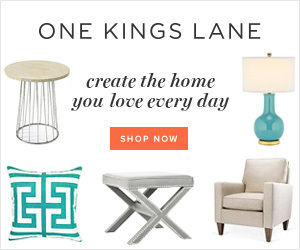 Perfect for fall transition! Such a darling look! I love that skirt especially! KIlling it! And nailing fall trends in the process. LOVE this! Love this and the idea of black with it would look stunning as well. I love all of yourl backdrops in the pics. Love how you made chambray so Fall perfect!!! I have said this several times - you need to post more OOTD photos. Too bad the booties are not current - I love them - and that skirt too. It all looks perfect with a chambray. Love the location of the pictures, too. Don't forget to link this up on Thursday with me, lovely, stylish lady! Thanks. Enjoy your week! Love this whole look! Chambray is the way to go!! You're so gorgeous & I love that outfit! oooooh those booties are fabulous! my favourite thing about the colder weather is the outfits for sure, so i can see that skirt with a black top and tights - it would be SO cute. Love this entire outfit and I need some corduroy in my life! And I get what you mean about missing campus, college was a blast (minus the classes and studying lol). There's nothing better than New England in the fall. I adore that skirt. Looks so good on you. Yessss, lady- work that chambray! Love this outfit! Perfect Fall outfit. I love it. And Boston looks beautiful in the fall! LOVE the chambray and the suede! This skirt is so cute! Totally perfect fall vibes, Biana! Catching up on your posts. The Bachelorette Party in NY seemed like alot of fun and you got me wanting a new mattress! I love your outfit in this post and mixing the suede and chambray. I can totally picture you wearing the skirt with a long black skirt and black tights! Super cute! Stunning outfit and photographs dear, thanks for sharing! Wishing you a wonderful week!